Bells Rock Lighthouse – Chesapeake Chapter U.S.L.H.S. In the 1800’s, the dock at West Point was a major terminal for the Richmond & York River Railroad, which resulted in an increase of traffic on the York River. This led to the appropriation of $35,000 to build a lighthouse to aid in guiding the ships to the railroad dock. 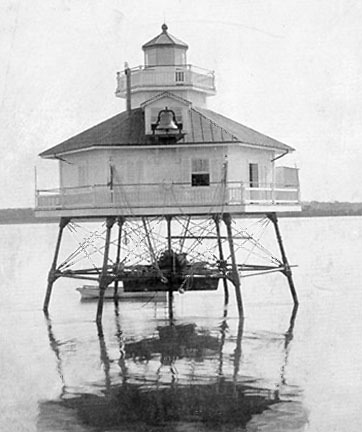 The lighthouse was built on the York River two miles downriver from West Point, Virginia. The first lighthouse was completed on November 26, 1880 at the Lazaretto Depot in Maryland but was used in the rebuilding of the Thimble Shoal lighthouse after it was destroyed by fire on October 30, 1880. The iron work for the second lighthouse began in August 1880 and completed on November 15, 1880. It was manufactured by Messers, Paulding, Kemble & Co. in Cold Springs, New York. The new superstructure was completed in February 1881 and towed to the site in the York River. Erection of the lighthouse began at the site in April 1881. By the end of April, the iron work for the foundation was completed and construction of the lighthouse began. The completed structure was a 40-foot-tall, hexagonal, screwpile lighthouse standing on iron piles in ten feet of water. It was equipped with a fourth order Fresnel lens which exhibited a fixed white light, along with a machine operated fog bell that struck at intervals of fifteen seconds. The lighthouse was completed at a cost of $31,186.64 and first lit on May 30, 1881. Bells Rock had a quiet history, except for a few instances. In June 1884, a schooner hit the foundation of the lighthouse and three support columns were broken and repaired a few weeks later. In early 1891, there was an incident with one of the head keepers, William T. Blassenham. Lighthouse inspectors Captain C.J. Train and Lieutenant S.W. Hourigan made a visit to the lighthouse to investigate charges of Blassenham leaving the lighthouse unattended and coming back much later intoxicated. It seems that the witnesses could not sustain the charges to the commissioners and they were either paid or promised favors to get the keeper removed. The evidence was taken back to Washington, but the result was never known. Ironically, Blassenham retired that same year. In 1928 the lighthouse was dismantled and replaced by an automatic light on the original foundation. The current light can still be seen from shore near Belleview, Virginia. Forgotten Beacons, Patrick Hornberger & Linda Turbyville, 1997.